Take your mix to new heights. TRAKTOR KONTROL S4 is the acclaimed all-in-one 4-channel DJ system that puts all TRAKTOR software features at your fingertips. TRAKTOR KONTROL S4 includes a versatile, wide-frequency response audio interface. Connect turntables, CD decks, instruments, MIDI gear – anything you need to kick your performance up a notch. Four full-featured, ergonomic mixer channels are each fitted with 3-band EQs, filter knobs, and two FX sends. Filters and EQs can switch between TRAKTOR, Xone, and other industry standard styles to fit your taste. Connect turntables or CD decks. 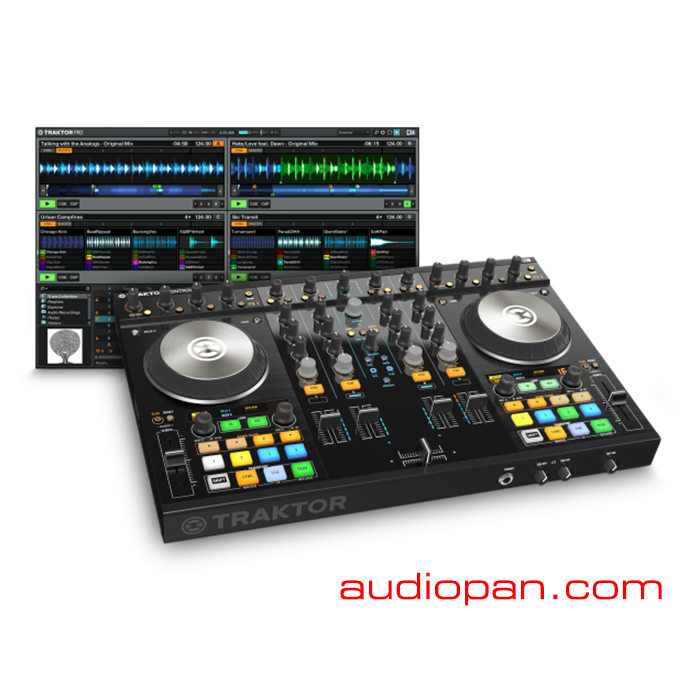 Use the S4 with the TRAKTOR Scratch Pro 2 Software and Timecode Kit add-on for classic control over your digital music. Take the party with you – TRAKTOR KONTROL S4 is also iOS ready. Create mixes in seconds with TRAKTOR DJ for iPad and iPhone – the world’s favorite pro DJ app. Touch the groove and deliver instant, high-impact DJ sets using hand gestures you already know.